4 New Year's Networking Tips For Non-Extroverts - Oak Park-River Forest Chamber of Commerce, IL ? Tip #1 - Join An Event Planning Committee – your natural instinct may to be to run for cover when asked to volunteer on a committee, but consider this – as a Chamber committee volunteer you will be working with a group of like-minded business owners, managers and local leaders, toward achieving a common goal. I’ve seen it over and over again. A disparate group with seemingly little in common ends up bonding over a job well done. I’ve seen social media experts get new clients; I’ve seen product sellers clinch orders; I’ve seen non-profits find fundraising partners - all from getting to know each other while conducting committee business. Free marketing. I love giving Chamber committee members recognition. 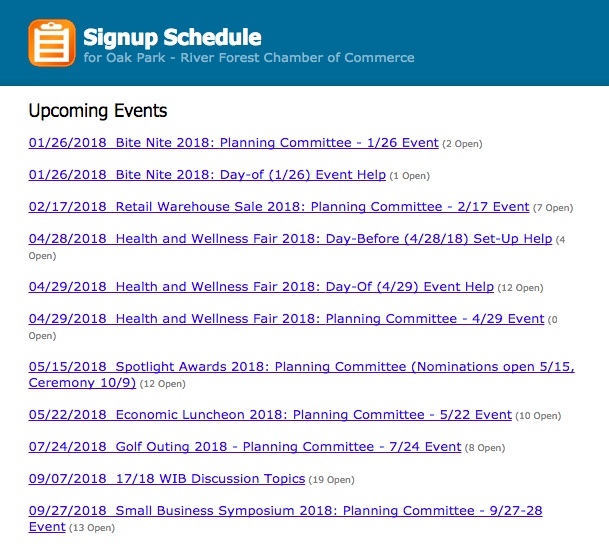 As a planning team member, your name, title and business name, with a link to your website, will be featured prominently on the event homepage. Thousands of people will view it – your peers, the public, the press and more. The links will stay up for a year. Build your professional reputation. Now your name and business have been showcased on our website as a community contributor, promote this involvement on your LinkedIn Volunteer Experience section. It is another place to spread the word about what you can do. Target prospective clients. We often ask committee members to help conduct outreach to get other Chamber members signed up as event vendors/participants. Reaching out as a volunteer on behalf of Chamber business is an easy value-added way to initiate a relationship with an organization you would like to work with. Learn a new skill. I learn new things with each committee. Did you know you could upload email addresses to Facebook and run specific ads to this group? I didn’t. The knowledge and experience of your peers runs deep. There is a lot to be shared and to learn. Tip #2 - Get Active In Social Media – it’s no hidden secret you can make great connections online and then follow up in the real world. Join a Facebook group. 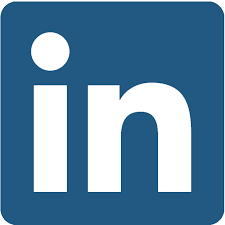 Actively post on your Facebook business page, Instagram or LinkedIn feed. Tweet. Follow and comment on other community businesses. You can interact from the comfort of your own computer. People will start to pay attention and will recognize your name. The business owners who are savvy marketers will take note when your online activity helps boost their profile, and will greatly appreciate it. They’ll want to return the favor. Have you joined our Chamber Members Facebook group, or the Shop Local Oak Park group? If not, start here. Tip #3 - Go To The Big Events Alone, As A Volunteer – It can be scary going to a big community event on your own. But not when you have a job to do - sign-up to be a day-of volunteer. We typically have many event day volunteer slots that get you interacting with other members and attendees. Depending on the event, volunteering can also often give you perks such as free tickets. Tip #4 - Start Blogging – Blogging is the best online “get to know you” there is. Done right, it provides your audience with a personal peek into your professional world. You can share knowledge, product information, news that affects your industry or even personal observations. Not comfortable writing? Reach out to the social media groups you joined in tip #3 and ask for recommendations for local copywriters who will write blog entries for reasonable fees. Don’t have your own blog? Don’t sweat it. That’s why we developed “Ask An Expert” on the Chamber website. It’s a blog generated from Chamber member submissions we promote in the weekly Chamber e-newsletter. It’s your free introduction to 1000+ recipients. Plus, you can take what we publish and push it out to your own social media networks. Bottom line, networking is essential to your success. It won’t just be how hard you work in 2018, but also, who - and how many - you know. People who know you want to work with you, they want to buy from you and they want to talk about YOU. So, pick your tip and start reaching out! Sign-up for a 2018 event planning committee here. Not familiar with all of our events, learn more about our 2018 events here. Join the OPRF Chamber Facebook Group here. Sign-up for an event day-of volunteer slot here. 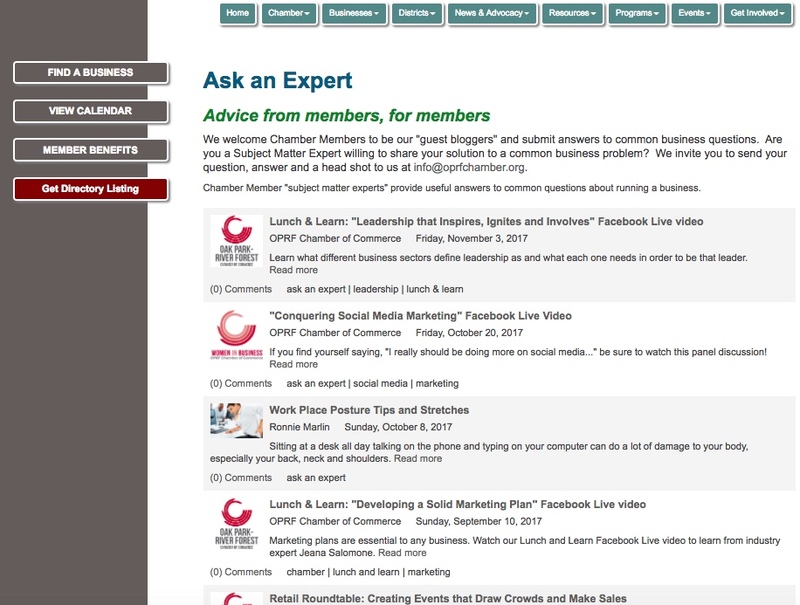 Learn more about Ask An Expert blog and submissions here.